HAL MCGEE - "Mr. McGee's Neighborhood"
Hal McGee - "Mister McGee's Neighborhood"
Gainsville FLA home taping luminary Hal Mcgee presents a collection of field recordings, conversations, and free-form music, blended together for a shirt-pocket view of the world which he inhabits. Join Hal on his various journeys through the neighborhood as he talks with friends, heads to the barber shop, and experiments with electronic sound equipment. Audio weaves in and out of the narrative experience, bringing simultaneous timelines together in an aural collage. Modular noise, garbage compactors, distant conversations, and traffic create a living, breathing world that Hal occupies and comments on. He often brings along his canine companion, Stanley, who contributes to the recording with occasional barking. The opening piece Lovebugs and Cowlicks begins with a reading about the traits and behaviors of love bugs, and the effects of their acidic bodies on automobile paint. Then, Hal takes a trip to get a haircut, which he does about once every nine months. Many layers of sound pass by the listener, as Hal's casual banter with the hairstylist ebbs and flows. At times we can hear Hal discussing some things with another individual. A landlord or property representative, perhaps? Interspersed is audio of Stanley getting scolded for his overzealous barking, or Hal explaining how various recording devices work to some listeners. I am Well-Traveled in My Neighborhood is a journal-esque entry where Hal outlines the routes that he moves upon and contemplates the concept of the area one is often bound to in everyday life and how that becomes one's world. in The Future of Assemblage Starts With You, Hal emphasises why this type of audio art is important, and implores the listener to become a participant. 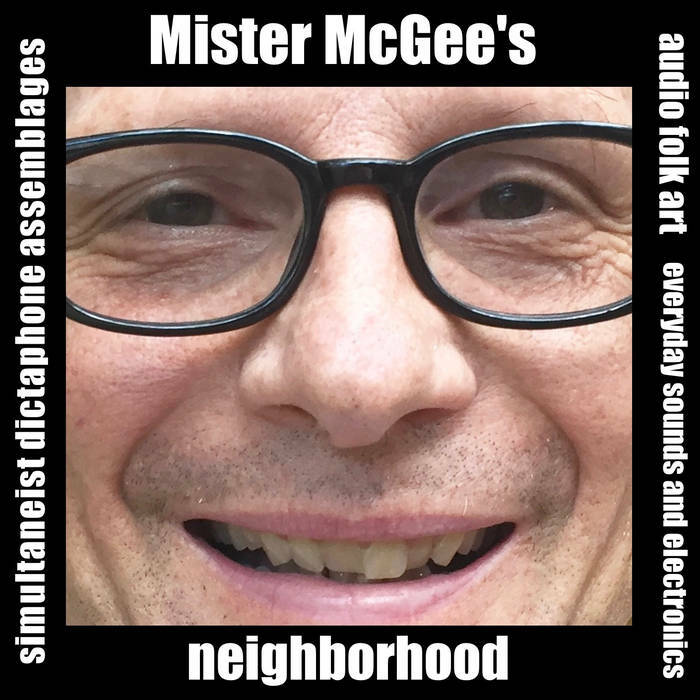 While certainly fitting in to Hal McGee's usual found sound/ modular electronics/ journal entry style, Mister McGee's Neighborhood is a particularly engrossing listen, full of detail, and personal reflection. It's the type of honest, unfiltered sound assemblage that make all of Hal's work so interesting. Newer Postll nøthing ll - "Therapy Session"
Older PostDOT DASH - "Proto Retro"